The industrial car manufacturers see in the high battery price an im-portant obstacle for an electric vehicle mass selling, thus mass production. There-fore, in order to find some cost relieves and better selling opportunities, they look and push forward to find profitable second battery uses. 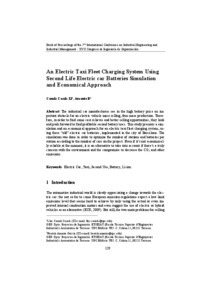 This study presents a sim-ulation and an economical approach for an electric taxi fleet charging system, us-ing these “old” electric car batteries, implemented in the city of Barcelona. The simulation was done in order to optimize the number of stations and batteries per station according to the number of cars on the project. Even if it’s not economical-ly reliable at the moment, it is an alternative to take into account if there’s a truly concern with the environment and the compromise to decrease the CO2 and other emissions. Canals, L.; Amante, B. An Electric taxi fleet charging system using second life electric car batteries simulation and economical approach. A: International Conference on Industrial Engineering and Industrial Management. "Industrial engineering and complexity management : book of proceedings : 7th international conference on industrial engineering and industrial management - XVII congreso de ingeniería de organización : Valladolid, July 10-12th, 2013". Valladolid: Publicaciones de la Universidad de Valladolid, 2013, p. 129-136.